Oh, you pig. Start low and be impressed when we give a higher figure. “Today we’re doing about 75 miles,” my Dad replied. The man grunted. He had started chatting to my Dad outside the gents’ bathroom. 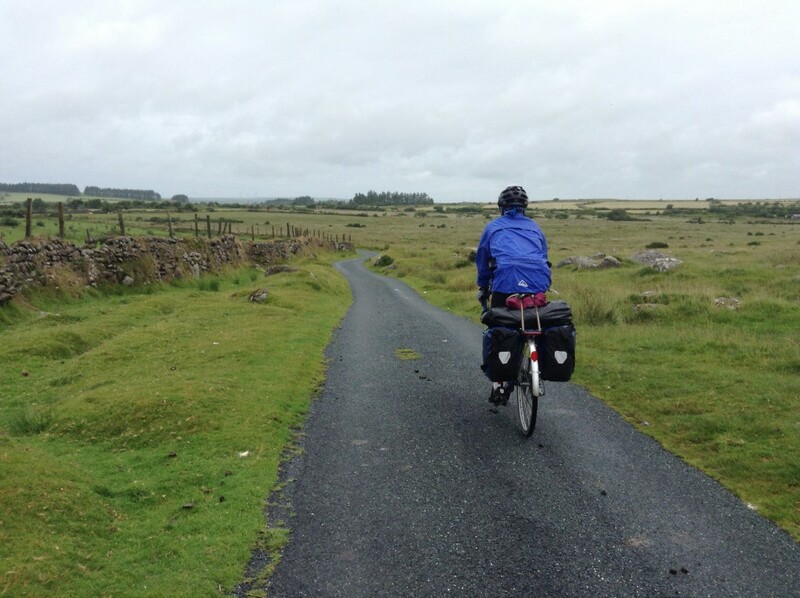 Mr 100 Miles wanted to do Land’s End to John O’Groats. I wanted to point out that 75 miles on a fully loaded touring bike up the hills is a blinking long way and he should cheer with approval, not just grunt, but decided to let him discover the truth for himself. 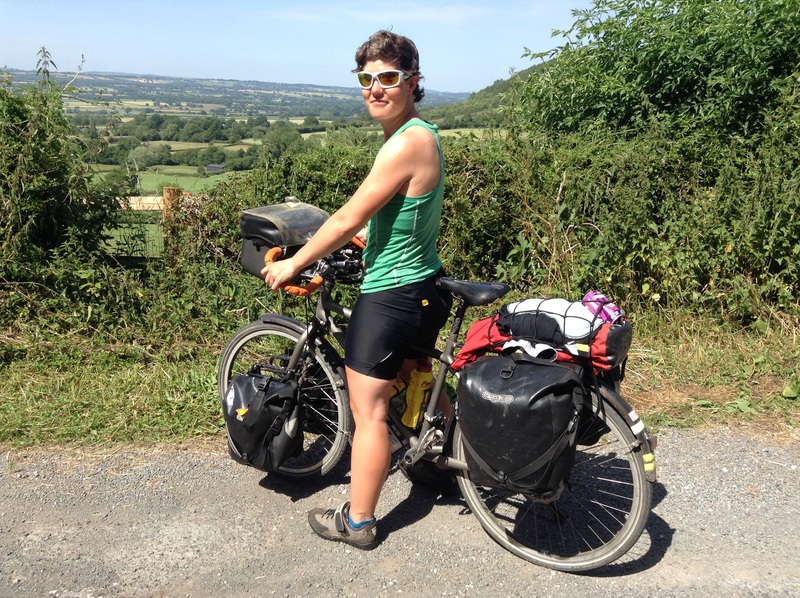 In order to carry the minimum amount of stuff through Devon I gave bits of my kit to Ruth (who came out to visit us on our rest day in Herefordshire) and to my Mum (who will be joining us in Scotland). Before I left I counted out how many contact lenses I would need. 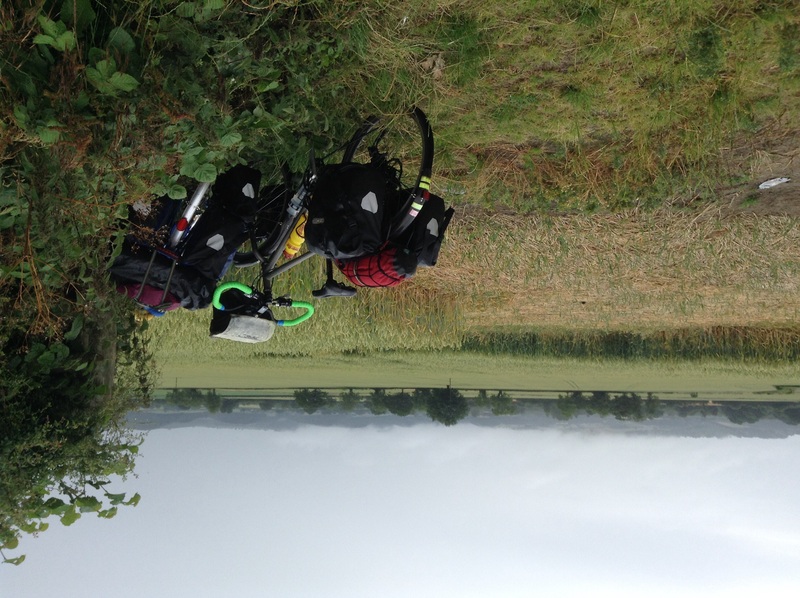 I gave a pack to Ruth, a pack to my Mum and packed a week’s supply in my pannier. 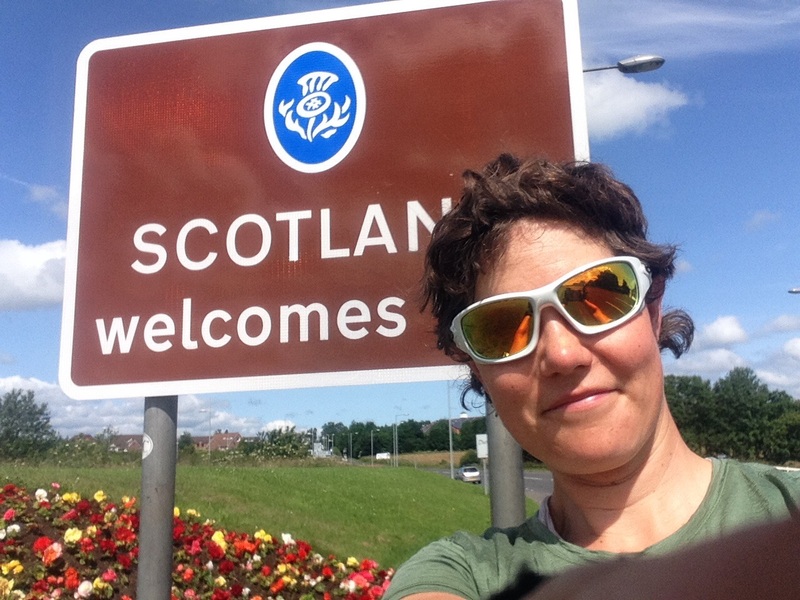 Ruth arrived with fresh supplies of clean undies, midge spray, snack bars and … No contact lenses. They had vanished. Eek. Ruth, lovely and kind person that she is, collected some contact lenses from home and post them first class delivery to the campsite in Loch Ken. All is good. Except now we have 75 miles to cycle to the campsite before the reception closes. It was a warm, bright and beautiful day. In fact, it would have been perfect cycling weather except for the head wind. We set off at 8am. Push, push, push. The morning was beautiful as we followed the Eden Valley. Green, luscious with low stone walls and plenty of sheep. All was going well until… Clunk. My gear skipped. I’d had an inkling before that all was not quite right with my gears. Clunk. It can’t have helped that cycling round flat, flat Belgium I was basically in one gear the whole time and that gear was now longer going to behave itself. Clunk. I thumbed into a lower gear and stood out the saddle to push up the hill. Pain. A long, sudden pain pulled down my quad into my knee. That would be a pulled muscle then. Less than 20km down and now with gear and leg problems, there was nothing to do… But push on. We nipped into Carlisle just long enough to stock up on food for the day and for my back wheel to get stuck in a drain cover (why!?) We hastily swallowed snacks outside the shop and then hopped back on our bikes. We pushed on. London than John O’Groats. Still so many miles to go. We pushed on. We stopped for a humus sandwich picnic down by the coast. A white washed cottage nearby was called Skiddaw’s View, very appropriately as the land faced over the Solway Firth towards the blue, whale shaped outline of the Lake District peaks. We pushed on. I cycled in a vest top, enjoying the warmth all the more after so many days of rain. We took turns punching the wind as we followed the road past tiny village, hay bales and highland cows. We ate lots of sugary things to keep our legs going and pushed on. I love the views. You can see for miles and miles. There are mountains in the background and lush green fields full of cows and hay bales in the fore. The road winds up the hill to reveal a new vista: cottages, a farmhouse and a new blue line of mountains in the distance. Where is that? How far is that? We’d been cycling for just over seven hours by the time we pulled into the campsite. We’d been on the road all day and arrived at the reception with just half an hour to spare. “Ah, yes, you have post!” The man handed over my neat package, containing six pairs of lenses and two small chocolate bars. We stopped. And then we ate. Today we dried off. 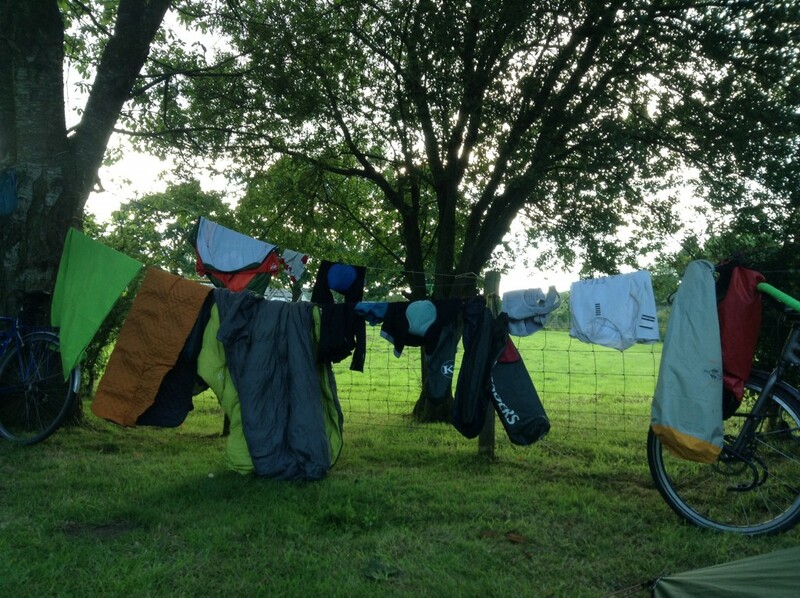 Last night we’d erected a washing line inside our lean-to and hug our soggy cycling clothes overnight. In the morning they weren’t quite dry and they still smelt as yucky as you’d expect but at least we hadn’t had to sleep with the whiff of eau de sweaty cyclist in our tents. I pulled on my wet shorts (not a feeling to be savoured!) and in their place hung up my tent to dry while we continued our morning ritual of porridge, tea and coffee. The first part of the ride was an easy one, following the A6 north and then meandering on a bike path through Lancaster. We met another LeJogger standing in the supermarket car park. For a cycle tourist, he didn’t seem very chatty but still recounted the issues he had experienced so far: he was supposed to be cycling with his son, who had gone home because one of his legs and one of his arms hurt. The man had also spent yesterday in a bike ride sorting out a buckled wheel. His bike had a trailer which meant he was carrying less weight actually on the bike. I wondered how on earth this had caused his wheel to buckle and then I noticed that he was carrying no fewer than 5 litres of water. It’s not exactly like the Lake District is short on water so goodness knows what else he was carrying. We had a scenic climb out of Lancaster as we ascended towards Shap. Beautiful views of the Lake District stretched away to our left: the ridge of the high streets in the background, green dales, a deep river valley, dry stone walls held together by clumps of moss, and a white sprinkling of sheep. Half way up the hill we stopped for a picnic in a lay bay and enjoyed the view. 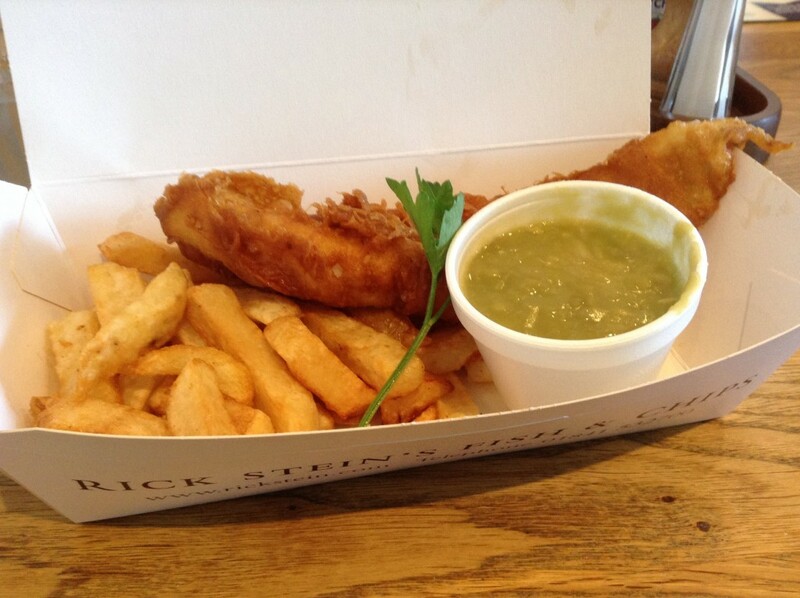 While we devoured Cheshire cheese from yesterday (was that really only yesterday? 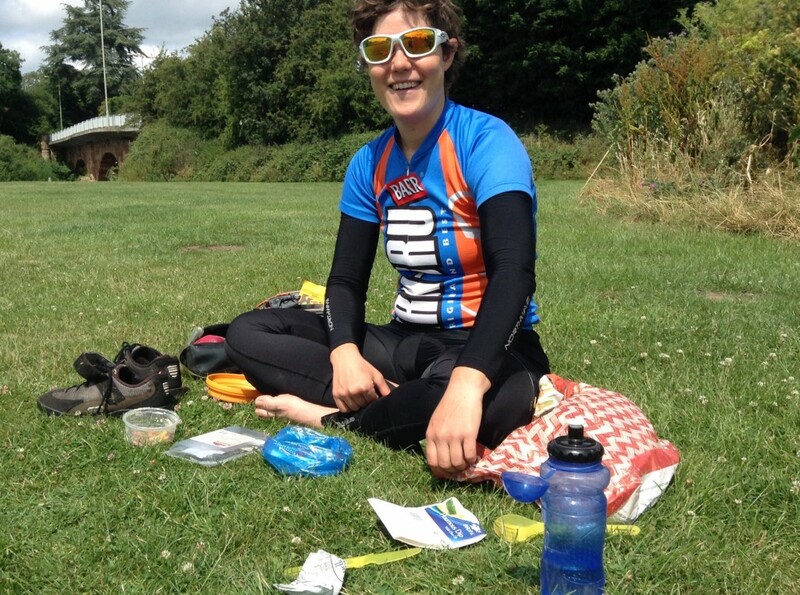 ), carrots and pretzels, our cycling clothes were left hanging over a farmer’s gate to flap a bit drier. Climbing up Shap was the focus of the day. 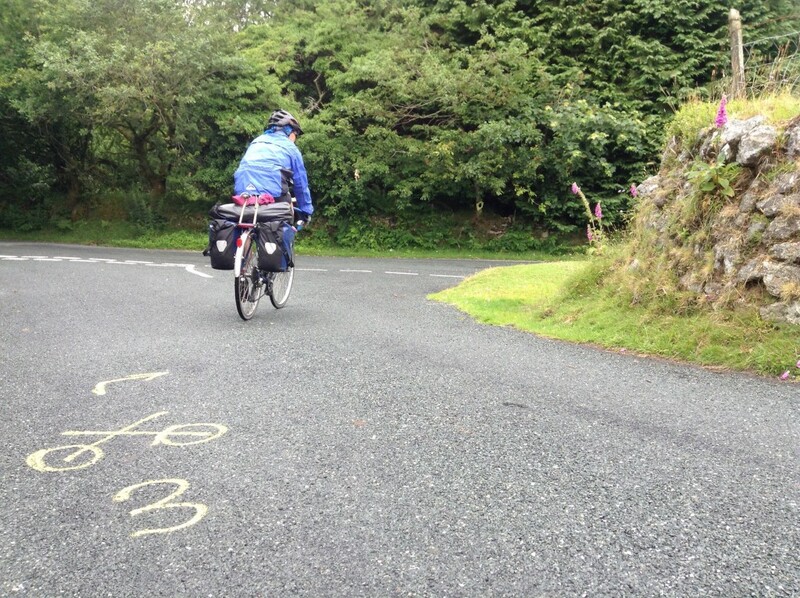 The summit, at close to 1400 feet, is the highest point in our ride to John O’Groats. I settled into an easy gear and marvelled at the funny shaped hills which geology had somehow squeezed and prodded like play dough into weird and irregular lumps. The clear weather at the top revealed a panoramic view of the surrounding hills: the Lake District on our left still and the Pennines now visible on the far right, stretching miles away into the distance over lush green fields and tiny villages. We celebrated the summit by eating the Kendal Mint cake we’d just bought (in Kendal). How appropriate. The rest of the way was downhill, in the literal sense, and anything but in the figurative sense. 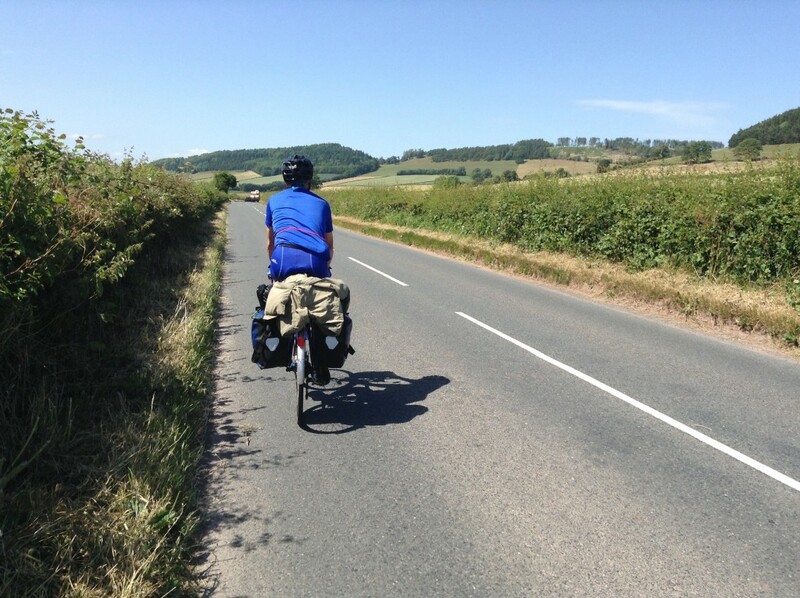 We freewheeled in fine weather down from Shap, skirted the edge of Penrith and headed into greener fields in search of our campsite in the Eden valley. At the campsite, we hung up our final washing line of the day to dry out our thermarests. The campsite shares its site with the community swimming pool and the local park. While locals learnt to kayak roll in the pool, teenagers hung out in the park and kids ran around the campsite. Dry at last, I laid down to start reading the book I have been carrying for two days but not yet had time to read. An oyster catcher called its way along the fast flowing Eden river that borders the end of the campground. In the background I can hear the beating sound of the teenagers dance music mixed with the rural baaing of the sheep. 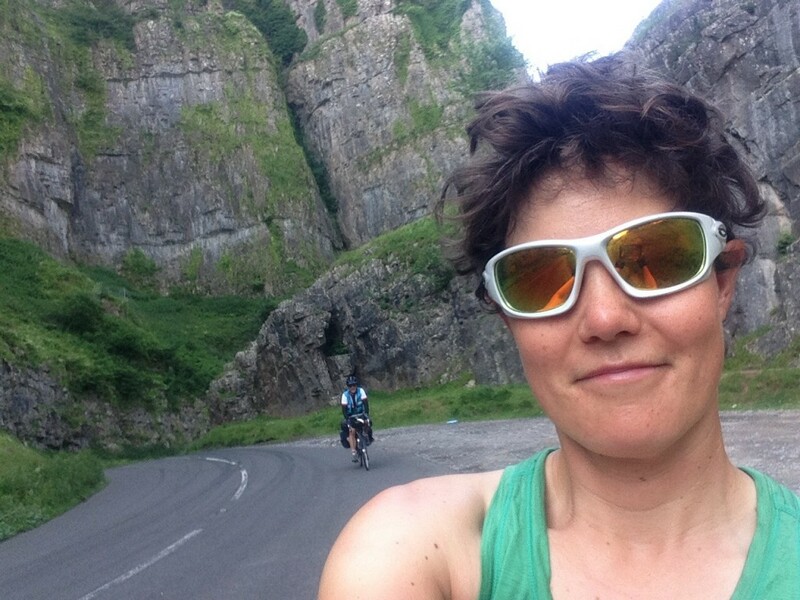 Climbing Cheddar Gorge is a good warm up for a day’s ride. We’d set off early before the sun was high enough to reach through the high walls of the gorge, offering us a quiet, cool road to climb. Goats wandered across, nibbling at the grass, the cats eyes, the white painted lines, indeed anything they could find to nibble. Forget the famous climbs of the UK, someone should really compile a list of the top 100 descents and the one from the top of the gorge should be on the list. It felt like my ears were going to pop. 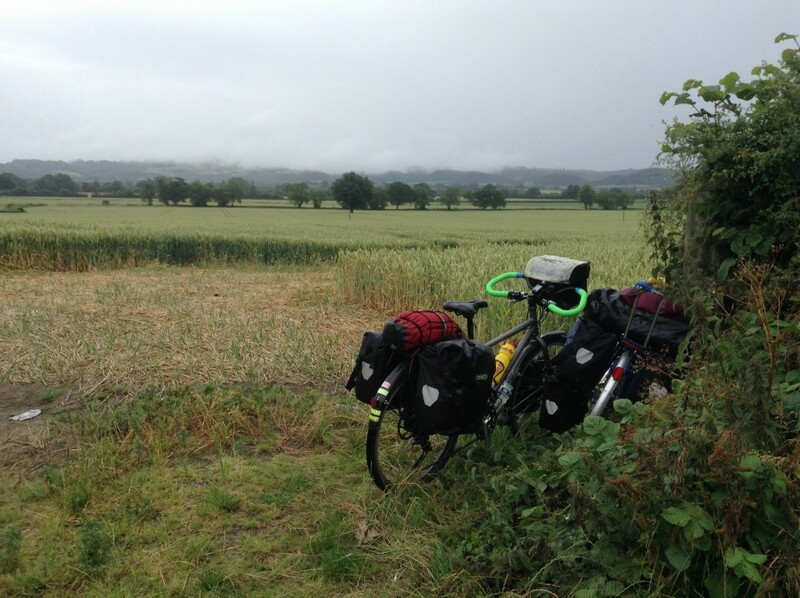 We covered miles in minutes as we swooped down past grassy fields towards the Yeo valley. Home to yoghurt and sunshine. Finally, after days of rain we had glorious, glorious sunshine. For most of the morning we followed the Strawberry line towards Bristol. This old railway used to take strawberries from the south facing hills of the Mendips to be sold in Bristol and London, but now in takes a mix of young and old cyclists past mini nature reserves and round suburb parks. We followed the Sustrans bike path behind Bristol, up and over the M5, past the landmarks that we see from the motorway that are still as unexciting up close: a bridge, a car park full of brand new imported toyotas, Gordano service station etc. We cycled past thick grasses and wildflowers, ditches and hedges full to life. Behind, the concrete towers of a chemical plant, or a quarry full of dust. The bike path weaves together this patchwork of lives, the urban and the wild. The old and the new. We had a relaxed lunch stop on a funny looking bench under the shadow of the Avonmouth bridge. 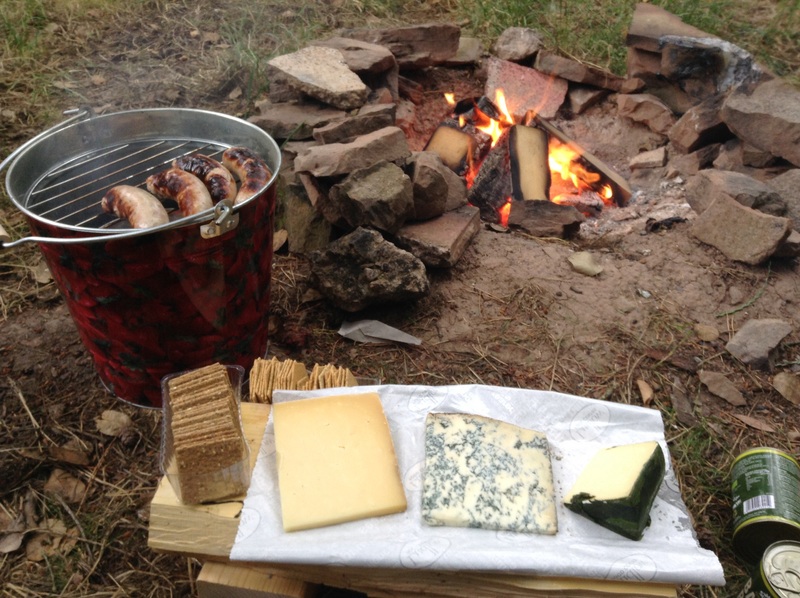 I dried out my tent as we munched plenty of cheese and biscuits while we watched the cyclists go by. Two folks from Birmingham who were cycling to Cornwall. A Mamil out on a day ride who looked at us enviously. Only when we got up to leave did I notice the celebratory plaque which marked out that we had been sat on a sculpture rather than a bench. I will skip over the bit about cycling over the Severn bridge. Because I am terrified of cycling over big, high bridges with strong cross winds. Needless to say, it was big, high bridge and there was a strong cross wind. Thank goodness that’s now over. We then made my shortest ever trip to Wales. It lasted for two miles before we turned right into Chepstow and pedalled over the river Wye and up a massive hill towards the campsite. 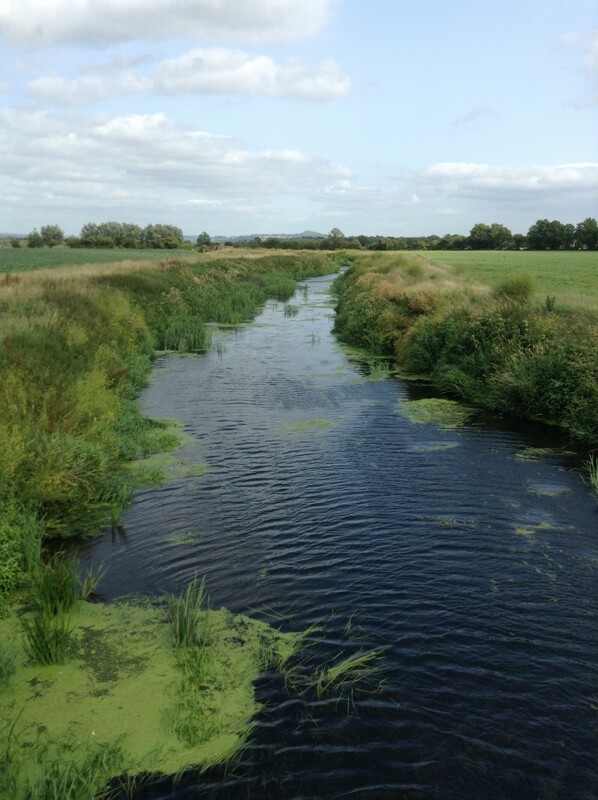 The Wye is wide, fast flowing and deeply set in its forest-covered valley. The valley is so deep such that, perched on our campsite at the top of the eastern hills, we could not see the river but looked straight across to the fading hills on the far bank. After dinner we set off down the hill to see the ruins of Tintern Abbey which sits opposite the Wye. The light was failing as we walked back through the woods. First I heard the scurrying noise of fast footsteps through the bush. Then the badge runs into the clearing on the path ahead. Stops. It’s head turns ninety degrees to look at me dead on. White and black stripes. Then it turns and run off. In the time that I can yelp to my Dad, another comes running out the woods and dashes across the path and disappeared after the first badger. In all my life I’ve only seen roadkill badges or, just once, some glowing eyes staring out from behind the bushes. In all the bridges, hills, buildings, and power plants it’s easy to miss and forget about this nocturnal life, hidden in the undergrowth, silent and yet unmistakably as much a part of the country as the landmarks of the day. Now sat outside my tent, I watch the last bit of rainbow light fade. A few whisks of cloud on the horizon sit over over the hills. There is a faint smell of woodsmoke. The air is silent like a pool of tranquil water, each sound – a bird calling, a bell tinkling, a sheep baaing – is like a droplet falling from a stray branch that breaks, just briefly, it’s perfect stillness. I was expecting it to be awful. Wet, grey, hard, relentless. Miserable. Previous cycling trips have taught me not to be overly optimistic about cycling through Devon but, joyfully, today was not that bad. 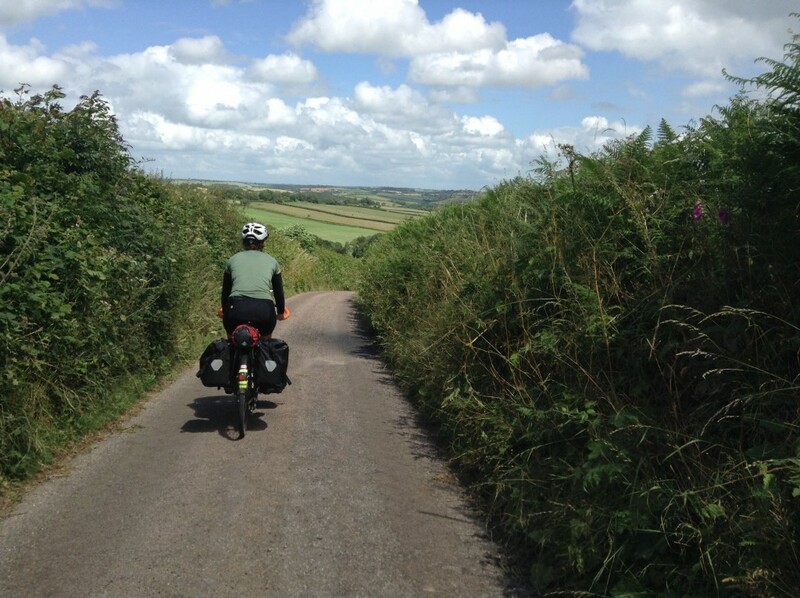 Many LeJoggers reckon that Cornwall and Devon are the hardest parts of the whole trip, because of the constant up and down of the many short steep hills. 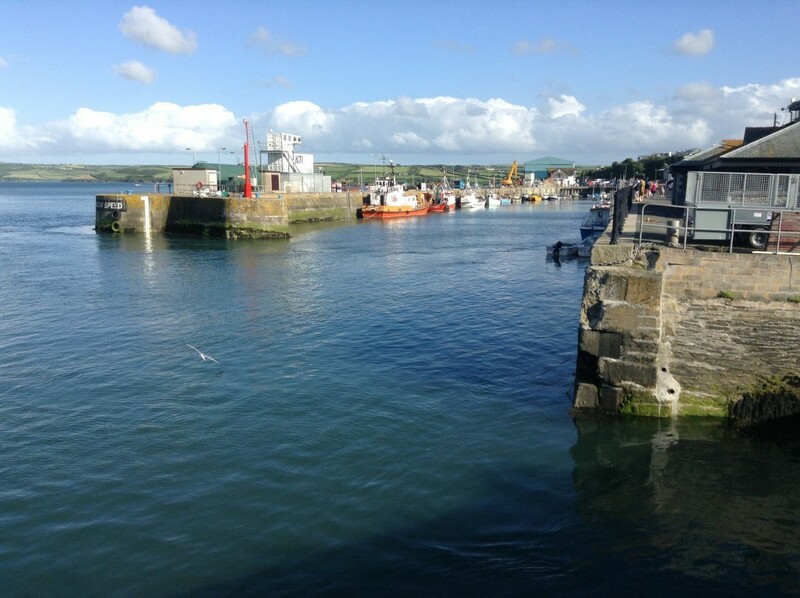 The prospect of 17 traffic-free level-ish miles would have been reason enough to camp at Padstow even without the magnificent views of Rock across the Camel Estuary and the lure of the Stein chippie. 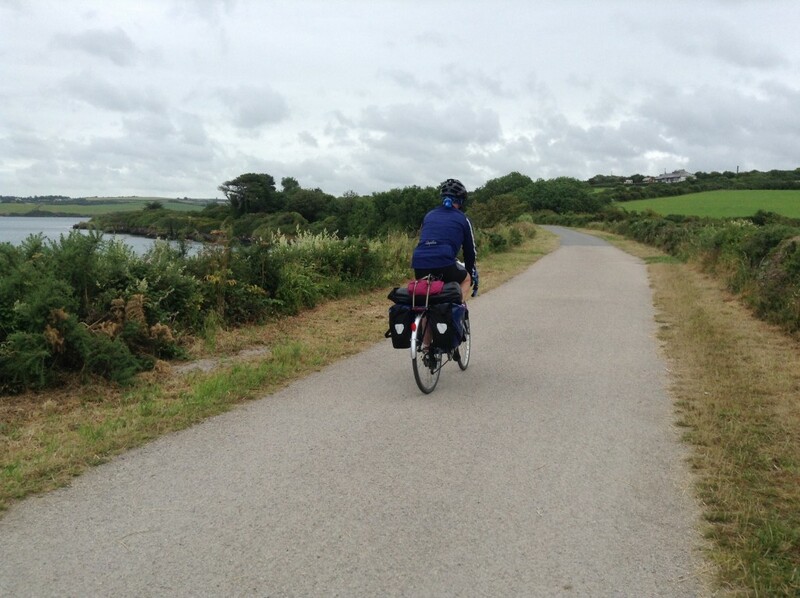 The Camel Trail follows the track bed of the old railway upstream through Wadebridge to Bodmin. From just outside Bodmin, we took the northern branch which winds its way up the increasingly narrow river valley to Wenford Bridge, to find the delightfully-named Snail Pace cafe. Delightful too for possessing the first cycling-your-own-smoothie machine I have ever seen for pedal-powered puréed mango. Having more than enough miles to go we opted for the more sedate tea, coffee and organic carrot cake to fortify ourselves for the ascent of Bodmin Moor. We climbed up the side of the moor on classic Cornish knee-crunchingly steep lanes that were lined thick with gorse and foxgloves. At the top, the open moor was quiet save for the rasp of the southerly wind and the bleat of a lamb. 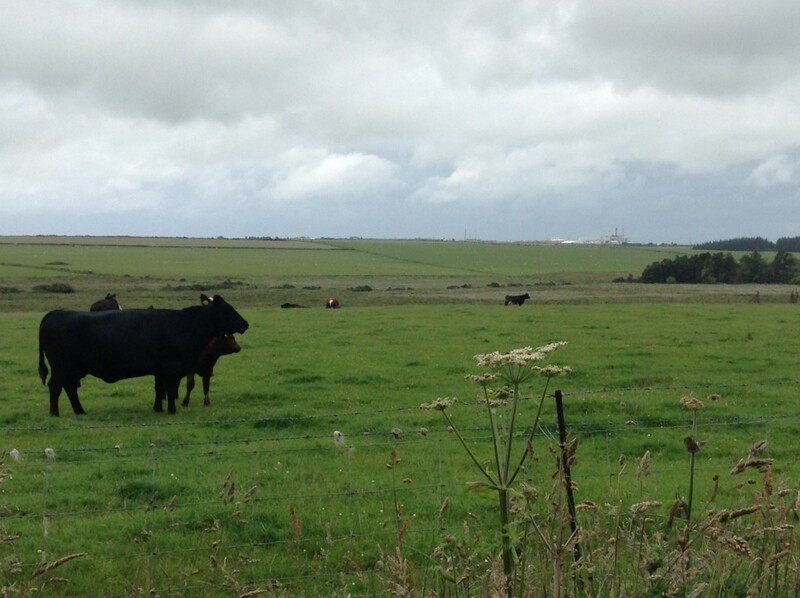 National Cycle Route 3 took us to within sight of the famous Davidstow creamery, and past herds which we assumed were responsible. We stopped for lunch a stone’s throw from the creamery and filled our chunks of bread with, of course, Davidstow cheddar. 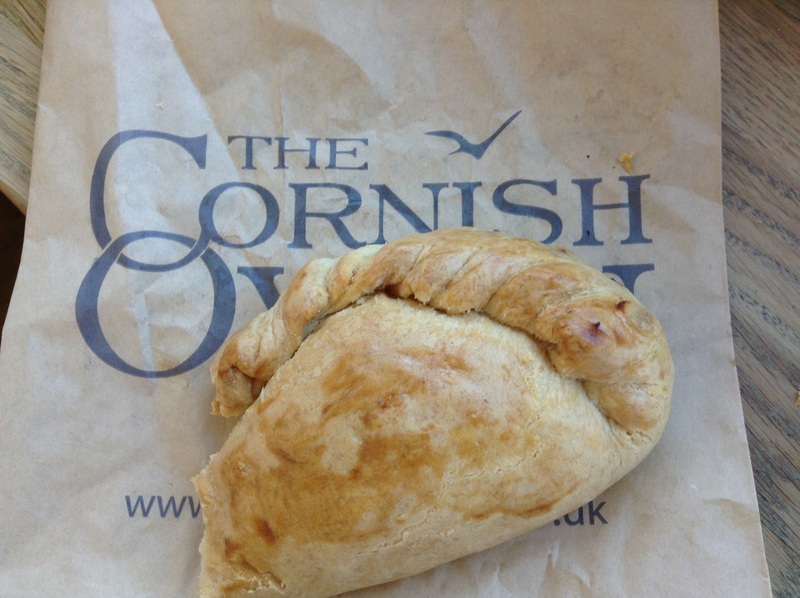 It would have had very few food miles had my Dad not purchased the cheese in Waitrose last week and had I not carried it on the train and hauled it for miles across Cornwall. There were plenty more ups and downs to tackle in the afternoon as we flicked up and down through our gears. One rise took us up over the crest of a hill with a view of Launceston below and the jagged peaks of Dartmoor beyond. Tomorrow we will take to those hills and I don’t expect another inch of flat ground before Somerset.